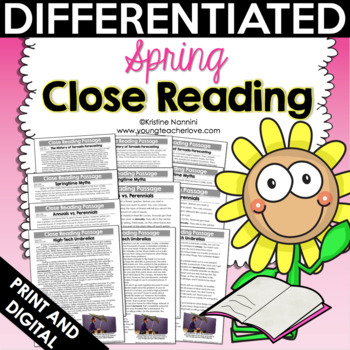 This resource contains everything you will need to implement close reading in your classroom! I’ve included THREE DIFFERENT LEVELS OF EACH PASSAGE for you to easily differentiate in your classroom! 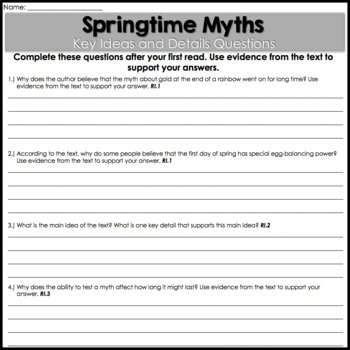 There are also text-dependent questions and writing prompts for your students to cite evidence from the text. You can use this pack for more than just spring! With all of the cross-curricular themes included in the passages, you can also use this pack during science, to study plants, weather, and more! Included in this resource are four spring-themed reading passages. 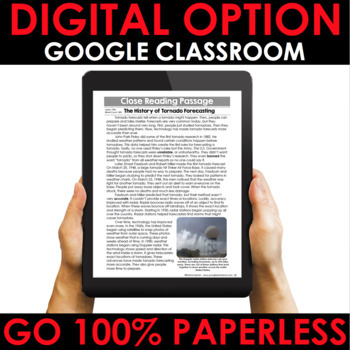 Each passage contains text features that your students must analyze. There are three levels of each passage so you can easily differentiate with your students. The levels are based on word count and Lexile levels which can be found in the top left corner of each passage. This printable helps teachers understand the purpose of each reading, and how each reading ties into specific Common Core Anchor Standards. I've outlined what each student should focus on, and the learning targets for each reading. 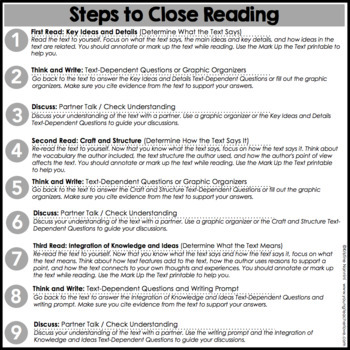 This printable gives step-by-step instructions for implementing close reading in your classroom. It can be used as your own personal reference and/or can be handed out to students prior to the first read. I've also included this printable with a spring theme. Each passage includes text-dependent questions for each of the three themes or categories in the Common Core Anchor Standards (Key Ideas and Details, Craft and Structure, and Integration of Knowledge and Ideas). Each passage also includes one writing prompt that is to be completed after the third read. This writing prompt requires students to synthesize or make connections by combining their thinking and knowledge with evidence from the text. Answer keys are included.